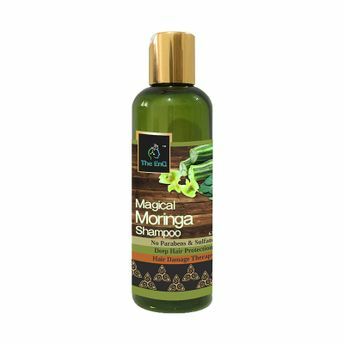 The EnQ Magical Moringa shampoo is a unique sulfate free and paraben free shampoo infused with Moringa Oil which is a rich source of Amino Acids and Minerals for your hair. It has been used as a key ingredient by Queens since Roman, Greek and Egyptian times. The high content of vitamin A, zinc, vitamin E, B vitamins, and silica are what helps to stimulate your natural hair growth, while at the same time addressing dryness, hair loss, brittleness and dandruff. Moringa helps improve the appearance of your hair, making it look shinier and healthier. This is because it has amino acids that are needed for keratin protein production. And with Moringa, you can also combat common hair concerns like breakage, dandruff and split ends.